Chief Minister Parkash Singh Badal's family of agriculturists is richer than the royal family of Patiala. While the Badals are worth nearly Rs 100 crore, Capt Amarinder Singh and his wife Preneet Kaur are worth less than half at Rs 45.71 crore. Although the couple's son, Raninder Singh, will file his papers tomorrow, his assets in the 2009 parliamentary election, when he contested from Bathinda, were Rs 7.28 crore and that of his wife Rs 6.47 crore. Chief Minister Parkash Singh Badal is apparently unaware of his actual age. In his nomination papers filed from the Lambi assembly constituency today, he claimed to be 84-year-old (as on January 10, 2012). However, in the 2007 assembly elections, he had stated that he was 76-year-old (as on January 22, 2007). With rebels continuing to trouble official candidates in some constituencies, Jagmeet Singh Brar, member of the working committee of the AICC, has sent an SOS to the party high command, requesting that a team of senior leaders be sent to tackle dissidence. Much before the litmus test of polls, it is the cumbersome nomination process which the candidates for the assembly elections are having to face. This hinterland in the Malwa region has become a political hotspot. Revolting against the allotment of the party ticket to Amarinder Singh Warring, senior Congress leader Sant Singh Brar joined the SAD and is in the fray as the SAD candidate. He is expected to cut into the Congress vote bank. The Congress is set to face a piquant situation with Raj Kumar Gupta, who has been replaced as the party nominee from Jalandhar (Central) with Rajinder Beri, announcing that he will file his papers tomorrow as the “official candidate” of the party. Gupta who was allotted the ticket instead of former Punjab minister Surinder Singla, was replaced with Beri with Congress councillors raising a banner of revolt against Gupta. State working committee member of the PCC and former MLA Vijay Sathi, having been denied the party ticket, has announced to contest from Moga where Joginder Pal Jain, sitting Congress MLA, is locked in a battle with former DGP Paramdeep Singh Gill of the SAD. The late CM Beant Singh’s daughter Gurkanwal Kaur has threatened to quit the Congress if the party does not change its candidate ( Jagbir Brar) from Jalandhar cantonment by Wednesday evening. Former Minister Sucha Singh Chhotepur today announced his candidature as an Independent from the Qadian Vidhan Sabha seat where SAD Education Minister Sewa Singh Sekhwan is locked in a tough battle with Charanjit Bajwa, wife of Congress Gurdaspur MP Partap Singh Bajwa. The PCC today witnessed fresh trouble in Majha with a group of leaders deciding to put up a joint candidate from Tarn Taran. All four Congress ticket seekers for the seat have revolted and decided to put up Gurminder Singh Rataul as their joint candidate against Dr Dharamvir Agnihotri. Capt Bikramajit Singh said all four leaders vying for the ticket, including Rataul, Gurwinder Mammamke, Jasbir Singh and he himself, had submitted a memorandum to the PCC that only a Jat Sikh candidate be considered. Bir Devinder Singh, former Kharar MLA, today jumped into the election fray with the People's Party of Punjab (PPP) clearing his candidature from the newly carved out Mohali constituency. The Congress may have changed its candidates in Amritsar (East) and Amritsar (North) constituencies hoping for better poll prospects, but the decision seems to have added to its woes. Gidderbaha: PPP chief Manpreet Singh Badal on Tuesday submitted the documents that he had failed to deposit with the returning officer here while filing his nomination on Monday. He had not submitted Form 26 attested by a notary or judicial magistrate and an affidavit of assets' details to Returning Officer Puneet Goyal. The alleged use of Punjab Police vehicles with red beacons atop for ferrying illegal cash has been posing a challenge to the Election Commission. Having made tall promises during its pre-election campaign, the Punjab government has ended paying lip service to the issues and problems concerning ex-servicemen in the state. Barring a couple of initiatives, most of items mentioned in the SAD's 2007 election manifesto remain unfulfilled. The Punbus and the Punjab Roadways have been awarded for having the lowest accident rate among all the state transport undertakings (STU) in the country for 2010-11. The Principal Secretary, Department of Health and Family Welfare, Punjab, has called a meeting of all civil surgeons of the state tomorrow to ensure that all cases of cancer are reported to the Government Medical College, Patiala, which has been assigned the task to prepare an atlas of cancer cases in Punjab. Local historian Surinder Kochhar today claimed that an ancestral haveli of Maharaja Ranjit Singh is being demolished in Gujranwala township of Pakistan to clear the land for construction of a commercial plaza. The police today seized unaccounted money worth Rs 28.5 lakh from three different places in the district during checking of vehicles and handed over the money to the Income Tax Department. For "challenging the power and majesty" of the Punjab and Haryana High Court, Justice Ranjit Singh recommended the placing of the Station House Officer (SHO) of Amritsar B-Division Police Station, Jagbinder Singh, services under suspension. The Tatas today defended its ambitious plans of raising skyscrapers in the vicinity of Chandigarh by claiming the project neither obstructed the view of the Shivaliks, nor was it in the Sukhna Lake's catchment area. What was the basis for seat allocations in the state this time? It was on winnability. Six people were taken from the Youth Congress and the rest all were selected on their ability to win. Your own brother, Malvinder, has revolted and gone over to the SAD. What would be the impact? Only a headline impact – we will win all the seats from Patiala even if he campaigns against us. From what it appears Malvinder has mentioned to the press that he met Mr PS Badal in his village two weeks ago. At that time we had not even started discussing the seats so it is obvious he made up his mind to leave even before that and only used this as an excuse to go. But why was your son Raninder selected instead of him? I think Raninder’s getting in was for a different reason. He was used by the party in the last Parliamentary elections to confine Badal to Bathinda and not allow him to move to the rest of Punjab. Though he lost he did his job well and I think Mrs Gandhi wanted to compensate him for that. Will not this raise issues about dynastic succession and affect your campaign against the Badal family? Rahul Gandhi has made a statement that this family thing should be done away with. I hope they do away with it at the national level with a policy framed for the whole country. Punjab will also fall in line. While SAD has declared Parkash Singh Badal as its choice for Chief Minister your party has not yet named you. Why? The Congress party does things differently. After we win the elections the Congress Legislature Party will meet to decide who should be the leader. Usually we will then leave it to the Congress President to decide. That happened to me last time. That seems to be the way the Congress does it in all states. And I think the same thing will happen here. There is talk about your wife, Preneet Kaur, being a candidate too? I have not heard it anywhere. My track record is there, my performance as Chief Minister is there and I think the government and our party president will see and decide whether it is good enough for the state or not. Then take a decision. The Chief Minister says though he is 84 he feels like 48. What is the difference in styles? I am going to be 70 and I feel like 35. He and I differ totally. He is a good campaigner but he has lost a lot of his credibility. He has been four times Chief Minister but has not been in anyway an exemplar. The government just exists and it is unclear as to whether Sukhbir runs it or his father does. What I hear about the Chief Minister is that he is indecisive. Meetings with him remain inconclusive and it’s a long time before a decision is taken. His system of working is old-fashioned. Here the government has to be quick. You have got to get on with life. Life is moving very fast now. How would you describe your style in comparison? I think you have to ask my officers that I have dealt with. I tried to take quick decisions. I never left anything sitting around. I do not think any meeting passed without a decision. So we moved very fast and that is why Punjab started moving. And suddenly it has come back to a full stop. Will Manpreet Badal splitting from SAD have an impact? I have been saying from day one that whatever Manpreet is going to break, he is going to break from the SAD and not us. Initially, there was an element among the young who thought he was talking the right language. But those who left Manpreet say that his functioning is dictatorial. It is a single system functioning like Parkash Singh Badal. What will be the key issues that will figure in the elections then? One is unemployment. Out of Punjab’s population of 2.74 crores we have 47 lakh unemployed or under unemployed. Now to do something for them we have got to have innovative industrial policies. For instance, today there are 14 permissions which are required from the government before they can clear an industry. We will have to have self-certification and single window clearances, otherwise why would industry come to Punjab? They will go to Gujarat and other places. Then we have to see that the power is available. Today because of lack of power, industries are shutting down for at least three days in a week. That is why our industries are running away to other places. Even the bicycle industry is going to Bihar. So we have to do something to hold them back and wherever the grievances are we have to address to those. That is going to be a main thing because the agriculture sector is never going to give you whatever you want. What needs to be done for agriculture? Punjab is an agriculture state. I suggested that all small farmers having less than 4 acres switch crops from wheat or paddy. They can grow oranges and earn much more if we encourage the setting up of world class processing plants to make juice out of them. We have to make major changes in agriculture to pull out of the stagnation. It was coalition politics that held it back. I am 100 per cent for FDI. If it comes you will not see, for instance, potatoes being dumped on the roads as is happening. If you have FDI you have at least a much larger market which can mop-up excess production. And it will also give farmers a better price than what they get at the mandi. Consumers too will benefit. The SAD has focused on a panthic agenda by inaugurating things like the Khalsa museum. Would that have an impact? This is nothing but a complete eye-wash by the Akalis. It has no impact on the people and the state politics. Let me tell you when I came to power, we worked on the Khalsa musuem project which was to be a high class project with hi-tech like the holocaust centre in Tel Aviv. But this has not been finished and yet they inaugurated it. A government’s performance is assessed by voters on the basis of good governance, removing unemployment and poverty, maintaining law and order, forming better agricultural and industrial policies and not on such tactics. Would the recent decision by the High Court to quash the notification preventing Sehajdhari Sikhs from voting in SGPC elections be a factor? Yes, it would have an impact. I support the verdict. Why should a Sikh who cuts his hair not be allowed to vote in the SGPC elections? After all we are not living in the 16th century – we are in a different world. All Sikhs who have cut their hair have not changed their religion. They are born to Sikh parents and have been following Sikhism and as such cannot be stopped from voting. There are 1.20 crore voters in the SGPC. If you remove Sehajdhari Sikhs and those Sikhs who have cut their hair, you have not allowed 50—60 per cent voters to vote in the SGPC elections. There is a Dharam Parchar Committee of the SGPC whose main function is to spread the religion far and wide. But they are not doing that and instead spending money on organising pandals, langars and elections. This is the nonsense that is going on in the SGPC. You took the support of the deras in the last elections. Are you looking for their support this time too? I hope I will get support from all these people this time also. After this Akali Government came to power, these people were beaten and harassed because they did not vote for them. This is not democracy. Will not corruption be an issue in the coming elections with the UPA government beset by the 2G scam? The Akalis cannot make it an issue because if you look everywhere in every field in the state they are making money – whether from mining, liquor, buses or on TV channels. So corruption in Punjab is rampant. At least in the Centre, action is being taken against the guilty. When I talked to people they don’t take care so much about corruption. They only bother about how they will exist and what we are going to give them in Punjab. People are responding to me very well. They know I can deliver the goods to them. They are not bothered about my personal life. They know in whose hands their future is safe and who can carry forward development in Punjab. As far as the Pakistan connection is concerned, there are so many, intellectuals, politicians, journalists and businessmen who are known to me. As far as the Pakistani journalist is concerned, it is an issue which is unnecessarily dragged by the SAD to divert people’s attention from their failures. That is shameful. What lessons did you learn from your last tenure and how will things be different if you are voted to power? During my last term, it took me two years to understand how the government and an efficient administration are run because I did not have enough experience of running a government. By the time I settled down well, the term of our government came to an end. But this time, my government will run efficiently from day one. Badal’s affidavit that formed part of his nomination filed from Lambi today showed he possessed assets worth Rs 6.92 crore. Interestingly, Badal has gone poorer by Rs 2.36 crore in the past five years. Sukhbir Badal had yesterday declared that he owned assets worth Rs 76 crore and his wife Harsimrat worth Rs 15.38 crore, making the net worth of the Badal family Rs 98.30 crore. Preneet Kaur has declared assets worth Rs 2.2 crore while Amarinder has declared assets worth Rs 43.51 crore. Amarinder does not own a car while Preneet has an Innova. Badal does not own any car but has a tractor (Tafe) worth Rs 3.25 lakh. Amarinder has shown his Patiala residence Moti Bagh Palace as commercial property worth Rs 35 crore. 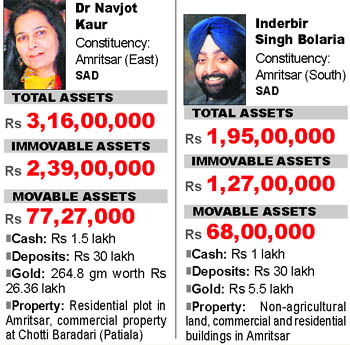 Badal's total movable assets are worth Rs 1.21 crore and immovable assets are worth Rs 5.71 crore. Manpreet Singh Badal, president of the PPP, has assets worth Rs 28.70 crore. Interestingly, the CM has even taken an oath on both the occasions, raising a big question as to how he turned 84 from 76 in five years. Even the notary which attested both the affidavits is the same. CEO Kusumjit Kaur Sidhu said, "It is not for us to challenge whatever is filed in the affidavit. If someone challenges it, we will act accordingly". Talking to The Tribune today, Brar said the next 24 hours were crucial for the Congress. “The Congress is on the road to victory but rebels can upset the party calculations in some constituencies. That is why I have urged the high command to send a team of central leaders immediately to start reconciliation talks with the rebel candidates. 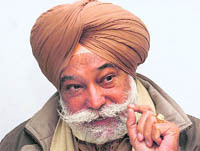 Brar is the Congress candidate from Kotkapura where a former minister has decided to enter the fray as an Independent. In the adjoining Faridkot constituency, the Congress has fielded Avtar Singh Brar. PPCC chief Amarinder Singh was keen to allot the party ticket to Kushaldeep Singh Dhillon, who quit the People’s Party of Punjab (PPP). Avtar Singh Brar now needs Dhillon’s support in the constituency. Already, Malvinder Singh, PCC chief’s brother, and Sant Singh Brar have crossed over to the Shiromani Akali Dal (SAD). Malvinder has started campaigning for the SAD candidates. 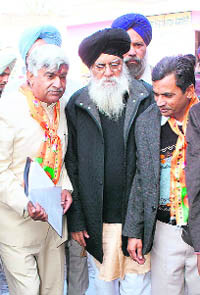 Sant Singh Brar is the SAD candidate from Gidderbaha. PPP chief Manpreet Badal was the first to feel the pain of the complicated process. He was issued a notice by the EC, asking him to complete the documents. "I am submitting the rest of the papers today. It took some time as it was a tardy process to procure all the papers required by the commmission," he said. “One is required to attach supporting documents in respect of all the assets. It is not easy. But I appreciate that the EC is tightening its noose around those indulging in malpractices. I am glad that nobody can take the EC for granted,” said Manpreet. 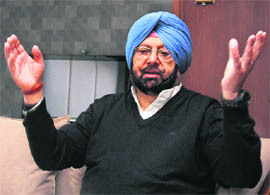 Similarly, PCC chief Capt Amarinder Singh said it took him seven days to prepare for the nomination. “I had to engage a lawyer to go through the papers. It is such a tedious process,” he said. Health Minister Satpal Gosain, BJP candidate from Ludhiana Central, said the process was cumbersome. “The EC wants details of everything you mention in the affidavit," he said. CEO Kusumjit Sidhu said candidates had been asked to provide proof of all movable and immovable assets. This had been done so that no information about the candidate this time held back. Projects: Waterlogging is one of the main problems in this constituency. As Finance Minister, Manpreet granted additional funds to tackle the problem. However, much remains to be done. Manpreet also took a keen interest in installing reverse osmosis (RO) plants in several villages to provide potable water to the residents. VOX POPULI: Stakes are particularly high for PPP candidate Manpreet Singh Badal who has represented the constituency four times as the SAD candidate. Considered a stronghold of the Badal clan, the emergence of CM’s nephew Manpreet Badal as a separate entity has confused the people. LOOKING BACK: Parkash Singh Badal began his political career in 1957 from Gidderbaha by contesting on the Congress symbol following an alliance between the SAD and the Congress. Subsequently, he won every assembly election, except one, till 1985. He fielded his nephew Manpreet in the 1995 byelection. Manpreet represented the constituency for four terms before he resigned last year after being expelled from the SAD. The Congress has managed to bag the seat only twice-in 1967, when Parkash Singh Badal was defeated by Congress leader Harcharan Singh Brar, and in 1992 when the SAD boycotted the elections. Manpreet had defeated his Congress’ Raghubir Singh by 18,828 votes in 2007. He said he would file his papers tomorrow after meeting his supporters. Dr Pawan Thapar, Punjab Mahila Congress chief’s husband, Dr Harjot Kamal, secretary of the PCC, Gursharanbir Singh Paggy, a youth leader, Pandit Sham Lal and Inderjit Singh Bir Charik are among those who have backed Sathi’s candidature. Former minister Gurkanwal Kaur said she and councillors Harwinder Singh Pappu, Rajinder Raju, Somdutt Nahar, Avinash Sharma, Raghu Nandan and Nishtha Goel would resign from the primary membership of the Congress if the party did not change its candidate. It is now clear that Chhotepur was eyeing the Congress ticket from either Qadian or the Gurdaspur seats. He had camped in New Delhi for a few days in an attempt to get the party nomination. The former deputy speaker of the Vidhan Sabha, Bir Devinder, said that he had formally joined the PPP while accepting the proposal of Manpreet Badal to contest the election from Mohali. "I have an advantage as voters of the area know my working style. I will seek their vote on the basis of my performance during my tenure in the Congress regime", he said. Bir Devinder was in the Congress before he turned Capt Amarinder's bete noire after the Amritsar Improvement Trust case. "My stint with the SAD was restricted to a joint press conference with SAD leaders. Thereafter they never called me", he said, while adding that he association with Manpreet started with the latter's 'Jago Punjab' campaign. Apart from offering meaningful governance, the PPP would offer a meaningful participation to the party workers. He, however, avoided queries regarding style of functioning of the party supremo. "I have always remained a whistleblower and a critique of the wrong functioning of the system. It does not matter to me whether I am with the ruling group or not. But in my long political career, I have learnt a lot of lessons after facing bitter experiences", he was quick to point out. On the forthcoming elections, he said that with him in the fray, election situation in Mohali had turned into a triangular contest. "If my old friend Balwant Singh Ramoowalia (SAD candidate from Mohali) is a good speaker, I am the best parliamentarian. But I always consider my opponent strong", he said. The Congress replaced Simarpreet Kaur Bhatia, wife of Congress leader Harpal Singh Bhatia who died in a road mishap a few days back, with former Mayor Sunil Datti for Amritsar (East) seat. It, however, came as a surprise for many as the Congress had moved Jasbir Singh Dimpa, who was a strong contender from Amritsar (East), to Amritsar (South) to accommodate Simarpreet. The party had allotted ticket to Simarpreet hoping to garner sympathy votes in the constituency where Harpal had been active for quite sometime. 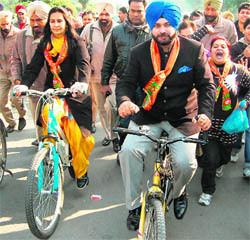 Her candidature also seemed apt as the BJP had opted for a woman candidate, Dr Navjot Kaur Sidhu, wife of MP Navjot Sidhu, who is also a political greenhorn like Simarpreet to contest from the constituency dominated by Sikhs. Moreover, there were no voices of dissent in the Congress camp against her candidature and unlike other constituencies, no Congress leader, including Datti, had opposed her candidature in public. Also, the fact that Amritsar (East) was a new seat and there were no old claimants for the ticket allowed the party to field Simarpreet. However, the move to replace her has angered Bhatia’s supporters who assembled at the Golden Avenue today and urged her to jump into the electoral arena as an Independent. If Simarpreet heeds to their pleas, it would certainly divide the Congress votes in the constituency. The Congress’ decision is also being seen as a humiliation to Bhatia family, which lost its son merely a few days back. The fact that the vehicles of two wings of Police Department were allegedly used yesterday for carrying black money to Amritsar has prompted Chief Election Officer (CEO) Kusumjit Sidhu to direct the expenditure observers to involve paramilitary forces to check the malpractice. Yesterday, former Chief Minister and Punjab Pradesh Congress Committee chief Captain Amarinder Singh had complained to Kusumjit that police vehicles were being used to carry cash for Congress rebels. Kusumjit took up the matter with Deputy Election Commissioner Alok Shukla in Delhi who ordered the checking of government vehicles plying on Punjab roads. The orders were issued yesterday and conveyed to all Deputy Commissioners. Meanwhile, Tamil Nadu CEO Praveen Kumar would be arriving in Punjab tomorrow to assist the election authorities to check use of black money to woo voters. Five years ago, SAD had promised "better and more" job opportunities for ex-servicemen in the state. Even the existing quota for ex-servicemen in the state government departments and other establishments remains largely unfilled. The state government rules provide for 13 per cent reservation for ex-servicemen, but according to informed sources, the intake against this is just about 5-6 per cent. Even the Department of Sainik Welfare is understaffed. For handling 22 districts, there are just eight officers with other posts lying vacant. Each officer has to take care of 3-4 districts, putting a question mark on the effectiveness of the welfare machinery in redressing grievances. There are about eight lakh ex-servicemen and 60,000 widows in Punjab besides their dependents. Over the years, they have been crying hoarse over what they perceive is step motherly treatment being meted out to them by the civilian administration. A large public rally was also organised by members of the Indian Ex-servicemen Movement (IESM) at Batala on January 8, where they resolved to support the party or candidate that would address problems faced by the defence community and help them in the implementation of the one rank-one pension (OROP) system that has also been recently recommended by a parliamentary panel. Following the rally, representatives of the IESM met Punjab Congress chief Capt Amarinder Singh as well as held a televised debate with Defence Services Welfare Minister Capt GS Batth. They also met erstwhile finance minister and now president of the People's Party of Punjab, Manpreet Singh Badal. The SAD manifesto had stated that if voted, it would take up the implementation of the OROP strongly with the Central government, but barring a resolution in the Vidhan Sabha, there is little indication of the matter being pursued meaningfully. Other matters that remain confined to the pages of the manifesto include a system to enable serving and retired soldiers to get back quick possession of their occupied properties and ensuring accountability of the local and district administration towards grievance redressal and welfare of the service community. Ex-servicemen are also peeved over their non-representation in various public forums like developmental bodies and grievances committee at the local level. Ex-servicemen have also pointed out the difficulty they are facing in getting tubewell connections as well as gun licenses. The cases of 38 war widows for allotment of a plot or compensation in lieu continue to hang fire for decades. On the other hand, the present government has enhanced the annuity of gallantry award winners by about 40 per cent and introduced a cash award of Rs 1 lakh for any domicile resident of Punjab who joins the armed forces as a commissioned officer. Setting up a training centre at Mohali for wards of ex-servicemen to prepare them for joining the forces and introducing some vocational training courses are among other initiatives taken by the government. The trophy and the award were received by Mandeep Singh, Secretary, Transport, Punjab, from AK Upadhyay, President, ASRTU, and Secretary, Ministry of Road Transport and Highways, Government of India, in New Delhi. The Punbus was also awarded for being one of the five profit-making STUs in the country. The Punbus and the Punjab Roadways have the distinction of receiving this award for the second year in succession. The accident rate for Punbus in 2010-11 was 0.0625 for every one lakh time operated, while it was 0.0436 per lakh km for the Punjab Roadways. Punbus has posted a profit of Rs 2.03 crore in 2010-11. The Punbus is one of the youngest STU in the country. Presently, Punbus and Punjab Roadways together have a fleet of 1,800 buses. Punbus has taken many innovative measures like introduction of electronics ticketing machines, GPS system and passenger information system, online reservation and advance reservation for providing convenience to passengers. The lowest accident rate in the country can be attributed to the addition of new fleet of buses every year, besides a check on drunken driving, over-speeding and intensive training and regular medical cheek-ups of drivers. Civil Surgeon Virinder Singh Mohi said the meeting has been called for helping the Indian Council of Medical Research and Government Medical College, Patiala, for generating reliable data on the magnitude and patterns of cancer in Punjab. The Principal Secretary had written to all the civil surgeons two months back to direct all persons concerned in hospitals (private or public), pathological, clinical, radiological labs and institutions imparting medical education and providing diagnostic, treatment and any other health care related facilities to report online, diagnosed or suspicious cases of cancer, and send a hard copy to the Head of the Pathology Department, Government Medical College, Patiala, (Population Based Cancer Registry), in this regard, but the issue got delayed due to some changes in the department. He further said that it would not only help in collecting reliable data, but would also help in finding out the reasons behind this disease. Kochhar claimed that he was informed about the move by his Gurjanwala-based friend Mohammad Kasim Rafeeq, who lives in the vicinity of the old building. Rafeeq called him up on his mobile phone this morning. He added that the building was damaged by armed goons despite local residents trying to resist the move. The residents were reportedly threatened with dire consequences. He claimed that the building had earlier been given a heritage status by the Heritage Department of the Pakistan government. He claimed that a leader of the Muslim League had played a key role in the demolition of the building. Kochhar said he had stayed in the said building for two days during his visit to Gujranwala. “Earlier, the building housed a police station which was shifted out around two years ago. Later, as the building was not cared for properly by the department, it turned into a safe haven for drug addicts and other anti-social elements,” he claimed. Senior Superintendent of Police (SSP) BL Meena said they have been carrying out search of vehicles to detect unaccounted money and supply of drugs and liquor to be used in elections. The Fatehgarh Sahib police recovered Rs 13.5 lakh from two separate persons. He said Rs 10 lakh was recovered from Rajinder Singh, a resident of Delhi, and Rs 3.5 lakh from Karan Maini, a resident of Mandi Gobindgarh. Similarly, Mulepur police recovered Rs 12 lakh from Harneet Kumar, a resident of Mandi Gobindgarh and Amloh police recovered Rs 3.5 lakh from Jasbir Singh, a resident of Kheri village. He said that as the persons could not provide the source of money they were carrying, the police informed the Joint Commissioner of the Income Tax and deposited the money with the department. Justice Ranjit Singh also made it clear that the cop could even find himself facing departmental and criminal proceedings for arresting an old woman hours after a warrant officer appointed by the High Court ensured her release. Justice Ranjit Singh asserted: "The facts in this case would reflect the highhanded manner in which the respondent police officer has acted." The warrant officer was appointed by the High Court after a habeas corpus petition was filed for securing Manjit Kaur's release. After the warrant officer found her in the police station, Jagbinder Singh said Manjit Kaur was free to leave, as she was not required. As the case came up for resumed hearing, the High Court was told that Manjit Kaur was again taken in custody soon after the warrant officer's departure; and both Manjit Kaur and her grandson-petitioner were given merciless beating for filing the habeas corpus petition. Jagbinder Singh, on the other hand, said a report was received that the two were breaking the lock of a house. Justice Ranjit Singh asserted: "The conduct and the action of the respondent is not only highly objectionable, but illegal and arbitrary, which has exceeded all bounds of fair play…. He appears to be carrying an attitude of he cares two hoots for the judicial order or proceedings before the High Court." "Such a police officer cannot be expected to function fairly and independently. A case may be made out for initiating disciplinary as well as criminal proceedings against the respondent. "To ensure fair inquiry against him and also for initiating criminal action, it would be just to relieve him of his appointment as the SHO of the Police Station, B-Division, Amritsar. More appropriate would be to place him under suspension for showing scorn to the proceedings before the Court". Justice Ranjit Singh also directed Amritsar Police Commissioner to relieve him and place his services under suspension. In a reply filed before the Punjab and Haryana High Court, managing director of Hash Builders Private Limited Sudhir Chadha claimed: "It is un-understandable as to how a project of the width of approximately 500 meters and ground coverage of approximately 13 per cent, having gaps of more than 90 feet between two blocks, with a proposed height of 92 meters, can obstruct the view of the Shivalik Hills". Claiming that the site was not a part of the Sukhna Lake catchment area, Chadha added the proposed project does not obstruct the natural flow of water to the Sukhna Lake. "Kaimbwala village, at an elevation of at least 5 to 12 feet from the site forms a natural barrier between the project site and the Sukhna Lake", Chadha said in the reply placed before the Bench of Chief Justice Ranjan Gogoi and Justice Mahesh Grover. The High Court has directed the continuation of the stay on Tata Camelot Housing Colony Project, coming up in Punjab's Kansal village. The stay orders came on a public interest litigation filed by Punjab and Haryana High Court advocate Aalok Jagga. His counsel DS Patwalia had earlier sought directions to Tata, the State of Punjab and other respondents to maintain status quo in the matter. The directions putting on hold the project were initially issued on January 20 last. The Bench of Chief Justice Ranjan Gogoi and Justice Augustine George Masih, in fact, ordered a stay on the booking, selling and construction of Tata Camelot Housing Colony project. Taking suo motu cognisance of the 35-storey structure's construction in the Capitol Complex's vicinity, the High Court had on November 15, 2010, ruled it revealed a "disturbing state of rapid and unregulated urbanisation".